Finding and nurturing future leaders are a primary concern for any organization and, indeed, for any profession. ASCE offers assistance in this regard by calling attention to younger individuals possessing extraordinary talent and ability. ASCE’s program complements the National Engineers Week Foundation’s program New Faces of Engineering, which celebrates the accomplishments of engineers 30 years of age or younger in a range of engineering fields. For many years the old trolley car and bus stop at the corner of Cheltenham and Ogontz Avenues in Cheltenham Township, Pennsylvania was considered the gateway into northwestern Philadelphia. Operated by the Southeastern Pennsylvania Transportation Authority (SEPTA), this trolley car/bus stop connected Willow Grove to North Philadelphia and began service as far back as 1907. However, as the population expanded and more motorists began hitting the roads, the location became a confined, congested, and chaotic traffic intersection. As commuters came to rely on this important bustling bus stop loop, SEPTA needed a plan to transform this location into a safe, secure, customer friendly transit hub to be at the center of Cheltenham community. In 2010, a 16-month $3.4 million SEPTA Cheltenham and Ogontz Bus Loop project was launched to accommodate what it estimated as the nearly 700 daily bus trips for approximately 5,000 passengers. The new bus loop would be surrounded by nine lanes of highway traffic. The design and oversight of the project, which was completed in July 2011, was performed by ERICA ANTOINE, EIT, A.M.ASCE, a civil associate in the Philadelphia, Pennsylvania office of Burns Engineering, Inc. Among some the major challenges Antoine and her team faced was: completing the design, permitting, and construction in a condensed timeframe, getting consensus from all the various stakeholders, reducing disruption of the regular bus service, eliminating bus routes entering site with left turns, enhancing the site appearance and limited customer amenities, and designing an effective stormwater management system to connect one and a half acres of impervious area to the existing municipal system. When not working professionally as a civil engineer, Antoine makes time in her busy work schedule to volunteer for outreach projects through the Philadelphia Branch Younger Members Forum. When in August 2011 he obtained a doctorate in civil engineering from Purdue University, KEVIN M. FORD, Ph.D., A.M.ASCE, became the first member of his family to reach that academic level. His parents grew up in Chicago’s Southside and lacked the means for such advanced education, although his father worked himself through school to join the first generation of college graduates in Kevin’s family history. This dedication, along with his mother’s strong support, helped inspire Ford to not just obtain a bachelor’s degree from Valparaiso University but to pursue graduate work at Purdue. Through his employment at CH2M HILL, Ford has worked on several high-profile transportation projects, most notably the long-term, multiphase infrastructure initiative by the Pennsylvania Department of Transportation to improve and rebuild Interstate 95 in Pennsylvania and the $3.45-billion project to transform St. Elizabeths Hospital, in the Washington, D.C., neighborhood of Anacostia, into the new headquarters of the U.S. Department of Homeland Security. With his work on the Pennsylvania Department of Transportation project, Ford served as the bridge technical leader in evaluating the project’s long-term planning needs. He accomplished this by developing his own Excel-based tool that incorporates complex mathematical principles and will assist the department in allocating taxpayer funds while ensuring roadway safety. “With CH2M HILL, I have had the opportunity to work on a wide variety of studies in the transportation field,” says Ford, who was recently honored in his firm’s Rising Stars program. His goal in conducting traffic studies using modeling software packages is “to try and predict future traffic volumes and evaluate project alternatives and their respective roles in reducing congestion.” In addition to conducting safety reviews by analyzing crash trends, his duties include making field visits to help determine which types of countermeasures would be most effective in reducing fatalities and serious injuries. Actively involved with the Transportation Research Board, Ford coauthored a report in the National Cooperative Highway Research Program dealing with ways of estimating the life expectancies of highway assets. He has also made more than 10 presentations at Transportation Research Board conferences, and he reviews technical papers and serves on committees dealing with transportation asset management tools and with the analysis of bridge life-cycle costs. Ford and the CH2M HILL team were recently selected to help lead research efforts on a National Cooperative Highway Research Program project that will develop a guidebook senior department of transportation managers can use to analyze the likely system performance ramifications of investment decisions involving multiple types of transportation assets. Last month, approximately 30 people showed up at the home of OSCAR MICHAEL GARZA, P.E., PTOE, M.ASCE, to do some gambling. It wasn’t just any ordinary poker tournament; rather, the event was part of an effort Garza organized called the E-STARS [Engineers in Sports Tournaments for the Advancement of Regional Scholarships] Program, which raises money on behalf of various professional organizations for community outreach events and scholarships. As a child growing up in an underprivileged home in southern Texas, he always knew he wanted to be an engineer. Over the past nine years Garza, who now works as a project manager in the San Antonio office of Dannenbaum Engineering, has successfully designed or managed more than 50 mi of roadway and highway projects in the state of Texas. The largest was a $42-million project in northern San Antonio involving Bulverde Road, an undertaking that involved widening a two-lane roadway into a divided seven-lane thoroughfare; providing curbs, gutters, bike facilities, striping, cross-culverts, storm drainage, and basins for a water pollution abatement plan; implementing a storm-water pollution prevention program and a traffic control plan; and adding signs and traffic signals. As a professional traffic operations engineer, he has performed numerous traffic engineering analyses in an effort to alleviate traffic congestion in Texas. The largest analysis he performed was for a 2,700-acre mixed-use urban community proposed for southern San Antonio that would have as its centerpiece the 694-acre campus of Texas A&M University. For almost two years, ANDREW T. HABLE, A.M.ASCE, lived and worked in Panama in the province of Coclé as an environmental health specialist for the Peace Corps. In that remote area of the country he led two Peace Corps projects dealing with water supply, sanitation, and hygiene, and in that capacity he directly managed a total of 86 construction workers. The projects involved the construction of a 5.5 km water supply system and a latrine sanitation system in two small villages. The work meant enduring intense heat and heavy rainfalls and walking uphill and over rough terrain for long distances carrying additional weight. Hable helped to lead community meetings, obtain commitments from stakeholders, provide training in hygiene, and carry out baseline surveys of community health indicators. He also oversaw the formulation and management of budgets, accounted for all project expenditures, and carried out construction training and oversight. It was no accident that Hable got involved with international projects. Returning to the United States, Hable went to work in the Chicago office of AECOM, and one of the projects he has worked on is the $1-billion undertaking to design flood mitigation infrastructure in the Saudi Arabian city of Jeddah for the oil company Saudi Aramco. Hable says the trunk line system is currently under construction. Here in the United States, Hable is now working on a study to improve Chicago’s Circle Interchange. In this joint venture, AECOM will be redesigning one of the most congested highway interchanges in the United States for the Illinois Department of Transportation. “Downtown Chicago’s Circle Interchange has been identified as one of the most congested interchanges in the U.S., primarily by freight measures,” says Hable, who when not working as a civil engineer finds time to play soccer and serve as a referee. “Everybody in Chicago knows this is where all the traffic gets bottlenecked. Now there is a very rapid planning and design process to completely reconstruct the entire interchange system. Jorgenson has served as a volunteer coordinator for the Florida Engineering Society’s MATHCOUNTS competition, as a committee member of the East Central Branch’s chapter of ASCE’s Transportation and Development Institute, and as the chair of the Younger Member Forum committee in charge of a P.E. review course, and last July she received the Young Engineer of the Year Award from ASCE’s Florida Section. “I have always been kind of a shy person, so when I enrolled as a freshman at the University of Florida, I decided that I was going to change that,” recalls Jorgenson, who now works as a transportation engineer in the Orlando office of Vanasse Hangen Brustlin, Inc. “Because of my diverse extracurricular activities both during and after college, I believe that I am now more outgoing and more adventurous. All of these experiences have made me a better engineer and have contributed to my leadership skills. One of the things that helped Jorgenson finally overcome her shyness was delivering the student commencement speech at the ceremony held by the University of Florida’s College of Engineering. Professionally, Jorgenson takes an enthusiastic approach to her work and has applied her skills to such transportation planning and traffic engineering projects in Florida as the Navy Boulevard corridor study in Pensacola and the master plan for the city of Gulf Breeze, and she has provided traffic engineering support for the expansion of Wawa stores into the Florida market. At present she is working on large-scale parking demand analyses and traffic circulation studies for international clients in the Caribbean and the Middle East. Jorgenson says her passion is incorporating innovative transportation principles into her work in such a way as to create communities that are more livable and healthier. Jorgenson also enjoys participating in ASCE outreach projects to engage middle and high school students. “A favorite recent student outreach event was with middle school students,” she relates. “We did the paper tower challenge, where we gave students five sheets of paper and some tape, asked them to create paper towers, and then load-tested the towers. I have never seen seventh grade students more excited about an engineering project and to learn about buckling, compression, and tension. They were so thrilled; they were laughing and cheering when their paper towers finally buckled. It was really neat for the students to see that just five sheets of paper and some tape can support a load of eighty pounds. As the community service cochair of the Younger Member Forum (YMF) within ASCE’s Hawaii Section since 2011, Lin has helped organize a number of professional and outreach events. These have included holding a review course for those planning to sit for the P.E. exam, conducting monthly professional development meetings, organizing technical tours of operational facilities and construction projects, participating in the local MATHCOUNTS competition, and taking part in a student outreach event held at the University of Hawaii that challenged elementary school students to build bridges using Popsicle sticks. Lin also organized a project wherein the YMF partnered with the ASCE chapter at the University of Hawaii at Manoa in reconstructing a seawall to protect an important fishpond. For its efforts, the YMF earned ASCE’s 2012 Public Service Award and received a letter of commendation in the competition for the 2012 Younger Member Group Award (small group category). The most important thing that Lin says he learned from these volunteer projects is the value of teamwork. To promote networking and team building, he has also helped organize YMF golf outings and field a team in the local softball league. Lin, who holds a bachelor’s degree in civil engineering from the University of California at Los Angeles, adds, “In 2012 we went through a big turnaround [at Tesoro], and I got kudos from my superior. The old process unit was taken off-line, and we went through a period of renewal. It was really chaotic because we had a small time frame to get new capital equipment installed, so we had to build things within a very short time frame, as every hour cost the company money. But in addition, we had to build things of quality in view of industrial conditions like high temperature or high pressure, and I had to make sure that the foundations are right, the piping is right, and a lot of things go right. Fascinated with movies and filmmaking, JAMEELAH C. MUHAMMAD, P.E., M.ASCE, a structural engineer in the Chicago office of Parsons Brinckerhoff, recently decided to enroll at Chicago Filmmakers, a filmmaking school, to learn about screenwriting and make a documentary about the role of engineers. Muhammad says her desire to combine civil engineering with film and community outreach with young students reflects the influence of her parents. “My mother is a professional artist and my father, who was in the [U.S.] Navy, is a computer systems engineer,” she says. “They taught me how to imagine and how to focus to bring my dreams to fruition. Discipline and focus are where it all begins. Muhammad has experience with the structural design of a range of bridge types and with the structural modification of existing bridges. She has also performed detailed inspections, carried out structural analyses for emergency repairs, and worked on load ratings as part of Chicago’s bridge inspection program. She sees the work as vital in that it prevents bridge collapses, provides information about the structural integrity of bridges, and protects the public. Muhammad’s department at Parsons Brinckerhoff specializes in movable bridges, and she worked on the rehabilitation of Chicago’s Congress Parkway Bridge, which reopened in May 2012. She is currently the project engineer on work involving a bascule bridge of historical importance. The bridge’s sidewalk is being widened to better accommodate pedestrian and bicycle traffic, and her contributions on this project will help to relieve congestion along the Chicago Lakefront Trail. In 2002 Muhammad spent three months on a summer internship in Tokyo at the Kajima Technical Research Institute, where she worked in the advanced technology department with the earthquake motion and wind group. She completed a training program that focused on earthquake-resistant design, wind-resistant design, and vibration control for buildings and bridges, and her work involved assessing risks from seismic events, studying the wind environment, the analyzing the interactions between piles and structures. She later found her experience in Japan extremely helpful. Outside of work, Muhammad served as chair of the Structural Engineering Institute chapter within ASCE’s Illinois Section in 2012 and was honored with a public involvement award by the section. She also makes presentations and participates in workshops at schools and science museums to encourage students to consider engineering as a career. Because of her extensive work experience overseas during her career, ABENA OJETAYO, LEED AP, A.M.ASCE, sees her background as somewhat “nontraditional” in comparison with the backgrounds of other civil engineers. “Even as an undergraduate [at Cornell University] I was one of the few engineering students who pursued an international experience,” recalls Ojetayo, who earned a bachelor’s degree in civil infrastructure and sustainable development and a master’s degree in engineering management there. “For example, in 2005 I worked as an infrastructure planner on a development project for [the organization known as] A World Institute for a Sustainable Humanity on the island of Cephalonia [also known as Kefaloniá], which is on the [western] side of Greece. Ojetayo became part of a team that developed a plan based on the principles of sustainable development that included technical research, site surveying, and mapping. The plan included a proposal for providing transportation, energy, and infrastructure systems for the new settlement. Ojetayo also recently worked on an Anam City (http://anamcity.com/) project in western Africa, where she managed a multinational technical, design, and development team in planning the infrastructure, architecture, and urban design for a model sustainable city in Africa. Currently, as a facilities engineer for Cornell University, Ojetayo seeks to ensure that environmental stewardship figures prominently in the designs of the campus’s engineered systems. In particular, she is now involved in the design of Cornell’s NYC Tech Campus, which the university is constructing in partnership with the Technion–Israel Institute of Technology. The new campus will be in New York City on Roosevelt Island. “I am part of the project management team for the site development of the new campus, which includes all the utilities and infrastructure [and] the energy and transportation systems that will be constructed on Roosevelt Island to serve the campus,” says Ojetayo. “We are very focused on sustainability and committed to making the campus iconic—not just physically and geographically with the site strategically located between Manhattan and Queens but also as a model of pushing the boundaries of sustainability. The campus will be on the southern part of Roosevelt Island and will replace the Coler Goldwater Specialty Hospital and Nursing Facility. “Roosevelt Island is a really neat site because it appears isolated but has interesting connections to the city,” says Ojetayo. “So we are looking at ways to draw people in and experience an open campus and [we are] also [creating] a living laboratory for both students and faculty, who would engage with the campus through technology and the built environment. To VATSAL A. SHAH, P.E., S.M.ASCE, engineering is not simply a degree or a career; rather, it is a thought process that shapes the way one sees the world. Shah spent several weeks in 2011 and 2012 in Haiti assisting the relief efforts organized to help those affected by the devastating earthquake that struck the country in January 2010. While there, he helped design and plan a low-tech wastewater containment and treatment system for the Port-au-Prince area in response to a cholera outbreak. “My draw to civil engineering,” says Shah, who holds both a bachelor’s and a master’s degree in civil engineering (geotechnical) from the New Jersey Institute of Technology (NJIT) and is presently pursuing a doctorate there, “is because we get to be involved and see our work directly improve the day-to-day aspects of our society and the people around us. It could be designing a high-rise building foundation, inspecting a bridge that my neighbor takes to work, or being involved in a water treatment facility design; all of it will be fixtures used for generations to come. Upon obtaining a bachelor’s degree from the NJIT in 2008, Shah joined the Millburn, New Jersey, office of Hatch Mott MacDonald and enrolled in graduate school part-time. His engineering position with the firm today involves soil and geological investigations, as well as geotechnical evaluations and recommendations. His expertise in geotechnical engineering has helped the company’s Millburn-based environmental group complete more than 27 geotechnical projects for clients since 2010, including shoring, slope stability, foundation designs, and geotechnical recommendations, at locations around the United States. Shah says he routinely oversees projects from start to finish and is involved in all aspects of technical planning, oversight, design, and final reporting. His most recent geotechnical projects have included slope repair for Basket Creek in Long Eddy, New York; a wetlands endeavor in Toms River, New Jersey; and several natural gas compressor stations in the New York metropolitan area. In recognition of his contributions, the Central Jersey Branch of ASCE’s New Jersey Section honored Shah with its 2012 Young Engineer of the Year Award. “I was also able to develop my passion in geotechnics with the creation of a subgroup within our environmental subdivision that focuses on providing geotechnical services in-house and externally to our clients,” says Shah. “Hatch Mott MacDonald has allowed us the freedom to create and build this subgroup, [and it] has also provided mentoring and direction so this type of work could flourish correctly and become a success. We’ve completed more than twenty-seven projects to date. “Outside of work, I stay involved in many different engineering organizations and committees, such as the National Society of Professional Engineers, the Association of Environmental and Engineering Geologists, Professional Engineers in Construction, and, of course, ASCE. Shah says that his interest in engineering began early, as he was often taken to inspect pile foundations and see how asphalt, concrete, and soil could be used to support a large variety of projects, both large and small. Both his father and his grandfather worked in civil engineering and architecture. “Growing up,” he recalls, “they taught me successful [engineering] solutions aren’t always expensive and intricate but are often innovative, simple, and cost effective. There was a period in the 20th century when salt was being harvested in three areas along the southern part of San Francisco Bay, namely, Eden Landing, Ravenswood, and Alviso. In 2003 the State of California purchased the land from Cargill, Inc., and afterward the California Department of Fish and Game, the U.S. Fish and Wildlife Service, and the California State Coastal Conservancy launched a four-year process to design a restoration plan for the land. The final plan, known as the South Bay Salt Pond Restoration Project, was adopted in 2008, and the first phase of restoration started later that year. “I started working on that project when I moved out to California six years ago,” says JUSTIN VANDEVER, P.E., M.ASCE, who from 2007 to 2010 was a staff engineer and task manager for the California State Coastal Conservancy and assisted in the preliminary and final designs of the work to be carried out in the first phase. His work included hydraulic modeling, setting design criteria for water control structures, collecting field data, preparing design memoranda, carrying out engineering calculations, and estimating costs. Now a coastal engineer in the San Francisco office of AECOM, Vandever has project experience in tidal and estuarine hydraulics, sea level rise inundation mapping, coastal processes and flooding, water wave mechanics, and the design of coastal and estuarine restoration and monitoring projects. His current work at AECOM supports coastal and estuarine projects in San Francisco Bay and along the Pacific coast. Vandever’s most recent work at AECOM has included a climate adaptation and coastal resiliency strategy for the port of Long Beach, California; a sea level rise adaptation strategy for the City of San Francisco in relation to San Francisco Bay; and sea level rise inundation mapping in San Francisco for the National Aeronautics and Space Administration’s Ames Research Center. “I really do believe that the type of coastal engineering work that I do is kind of coming of age,” notes Vandever, who in 2012 earned a certificate in coastal engineering from Old Dominion University. 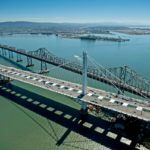 “I think the [San Francisco] Bay Area is kind of leading the country in hazard mitigation and climate change adaptation and planning. [Coastal engineers] here have learned a lot in those areas and can share that with the rest of the engineering community.